The best Thai food in New York is a bit of a hike from our place in Hell’s Kitchen. It’s a straight shot on the 7 train out to Woodside, Queens, a historically Irish part of the metro area that since the 1990s has been a magnet for a multicultural smattering of immigrants, including large Filipino and Thai communities. Hence its reputation as host to the city’s best Thai food. In my time in Los Angeles, Jas and the fine folks at Jitlada showed me what Thai food could really be, beyond the peanut-sticky-sweet pad thai and tame tom yums of university take-out joints. 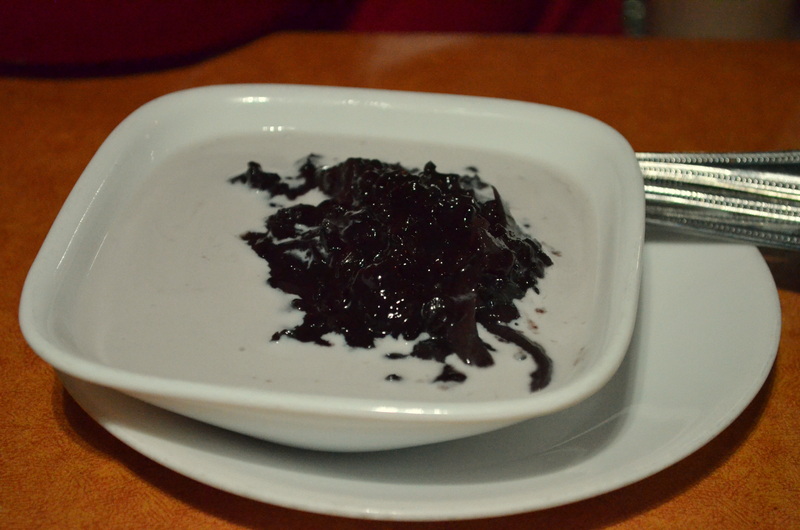 New York has in the past few years experienced an incredible reception to the peculiarities of Southeast Asian food. There’s Laotian cuisine offered up by Chef Phet over at Khe-Yo (which I unfortunately haven’t been to yet), Isaan-inflected Lower East destinations Somtum Der and Uncle Boons, Andy Ricker’s dedicated etude of the best things Thai at Pok Pok, and my neighborhood go-to Larb Ubol (as well as its new Soho outpost Lan Larb). There’s also a Burmese restaurant opening soon in Manhattan, I hear. So I took two trips out to SriPraPhai (its backstory here), on the recommendation of one of Jas’ customers, once alone and once with a group of five. Here are all the things we ate. 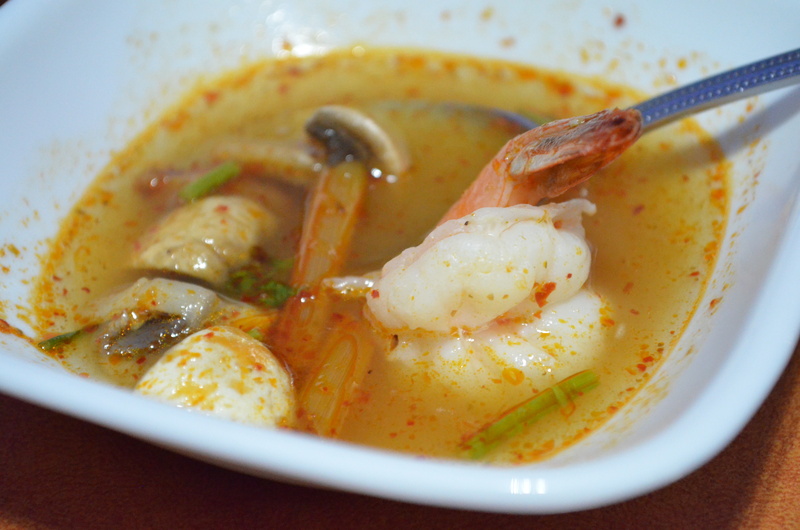 Shrimp tom yum soup – no shortage of flavor or spice here, with hearty stalks of lemongrass and a bowl rimmed with red. 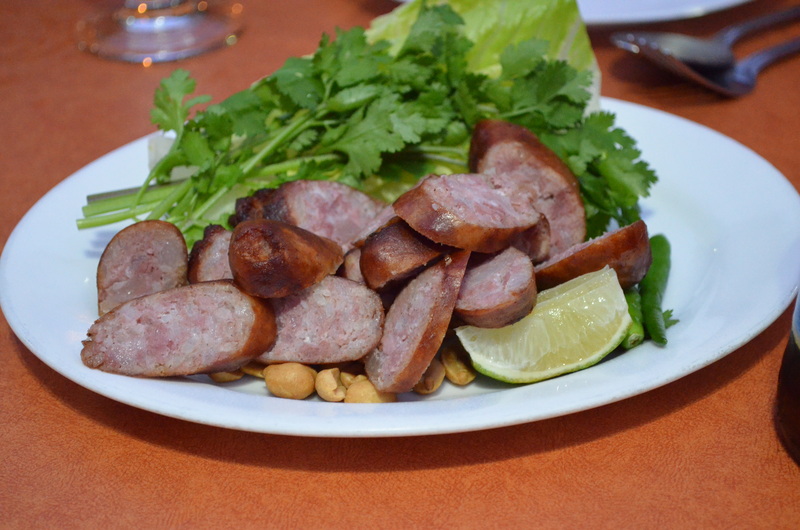 Sour Isaan sausage, sturdy and chewy, with a crisp casing. 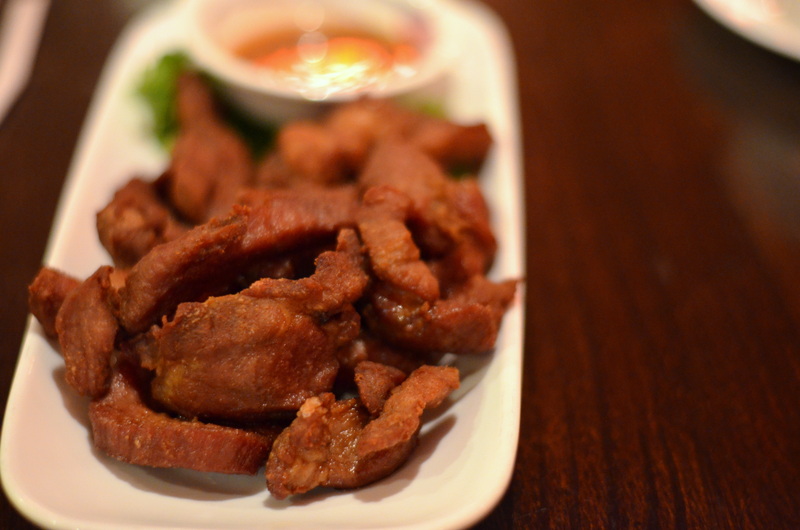 Fried marinated pork – chunkier and a bit less seasoned than I’d like, but perfectly crisp. 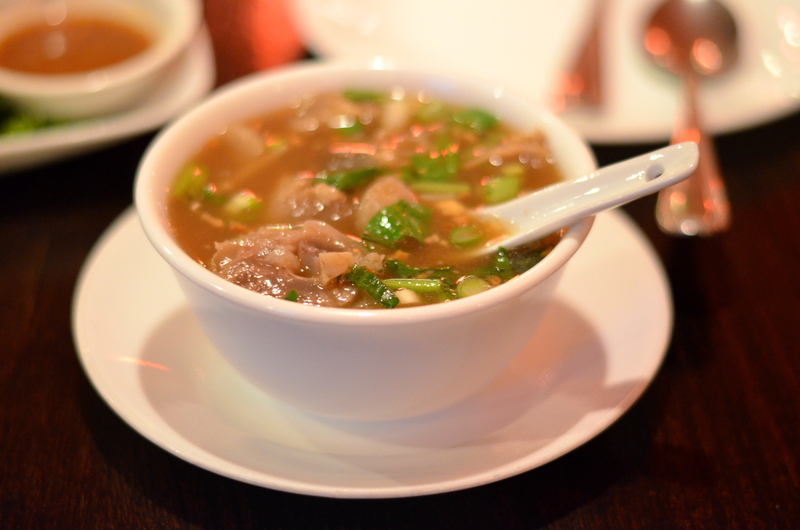 Beef tendon soup – gelatinous, with fat, chewy strands of tendon, the soup is surprisingly sour, the fresh cilantro a faint breath of lightness in what is otherwise an exercise in depth and richness. 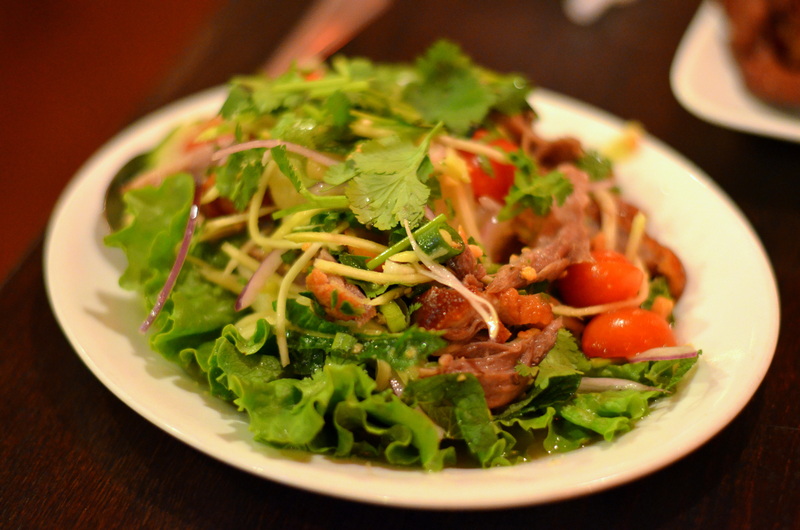 A vibrant roast duck salad, with onion, chili, ginger, lime juice, mango, pineapple, tomato, cilantro, and crushed peanuts. The fatty slivers of skin-on roast duck combine with the fruitiness of citrus and tropical fruit, and the slow-building kick-in-the-mouth, sweat-out-of-my-nose spiciness of whatever the dressing is comprised of. 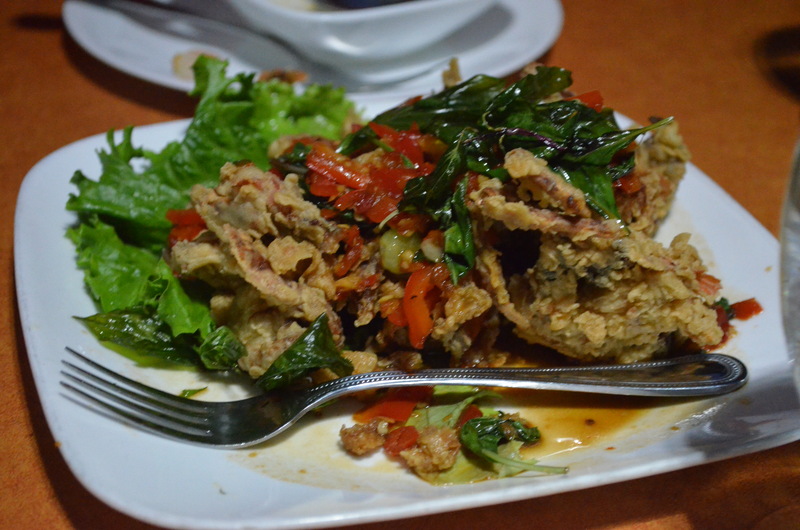 Soft-shell crab in basil chili sauce. Fried basil is the boss. For me, it’s hard to distinguish soft-shell crab past the obscene crunch (I mean that in a good way), but there’s just enough sweet, creamy innards for each crab to be worth it. 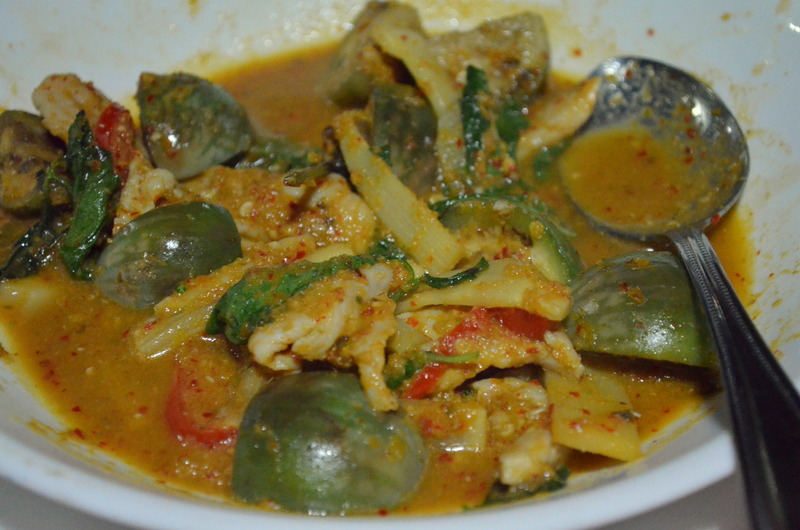 Pork jungle curry, with Thai eggplant and bamboo. 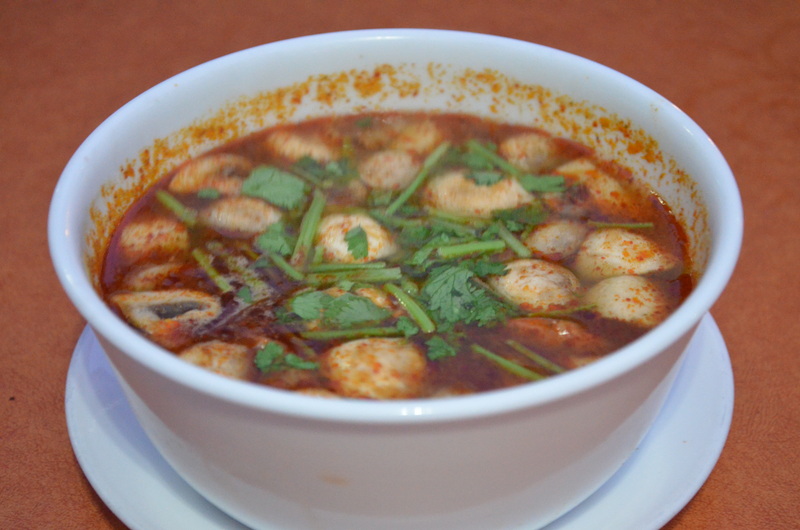 Jungle curry is watery, without the coconut, but what it lacks in body it makes up in heat, with sharp, penetrating spice unbounded by the mildness of coconut milk. 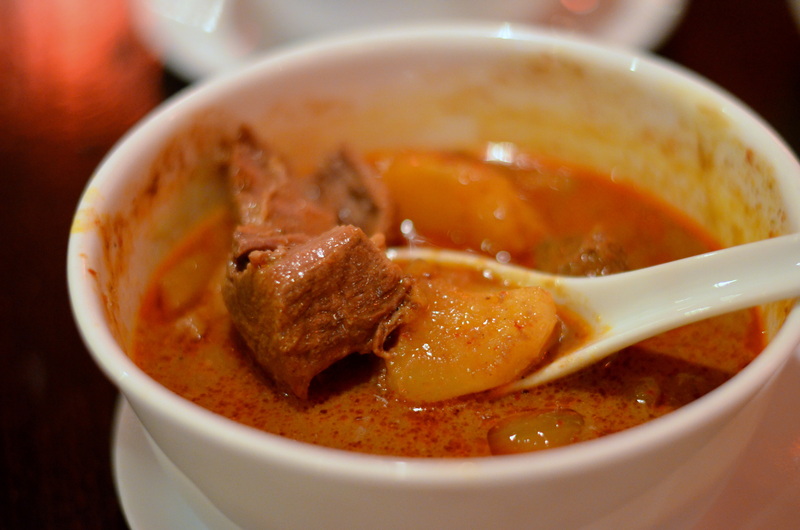 Beef Massaman curry with potatoes. Mildly sweet, it’s heavy, heavy on the beef, heavy on the potatoes, a meal unto itself. 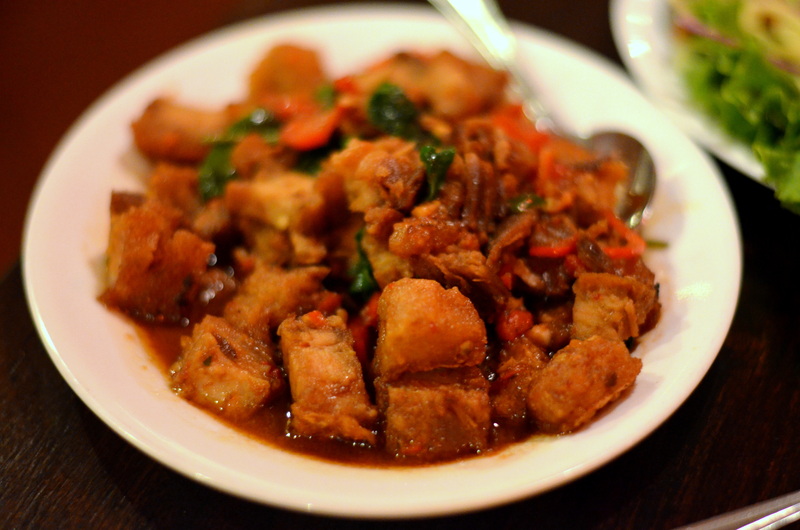 Crispy pork belly, sauteed in chili and garlic. The stir-fry sauce kind of offsets the crispiness, seeps into the fat, so it’s a bit incongruous eating really crunchy meat and spongy fat and then a crispy rind. But good flavor. 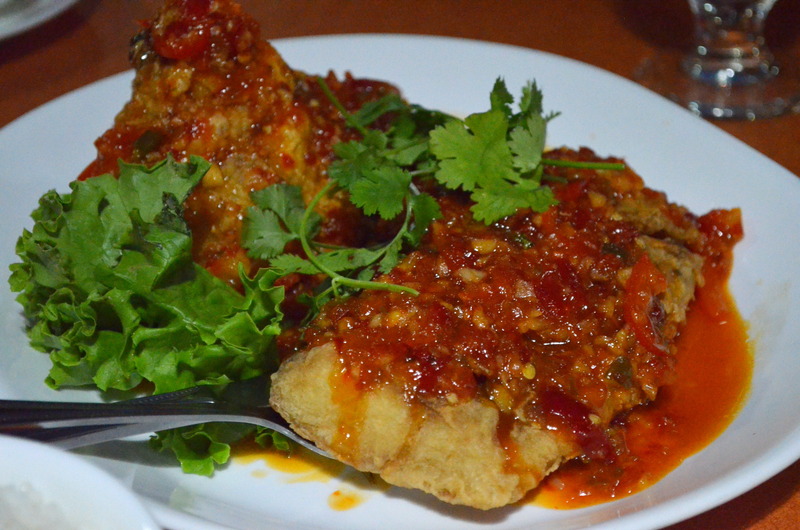 Fried sea trout filet in sweet chili sauce. A better vehicle for sweet and tangy sauce. 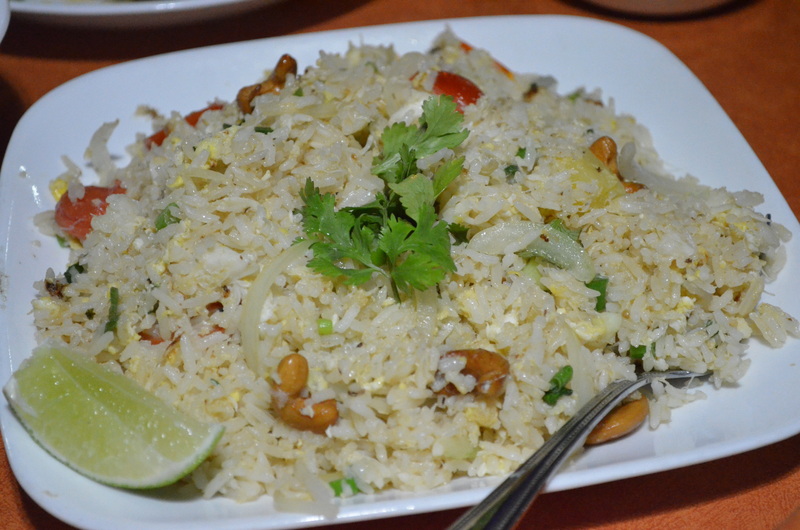 Crab fried rice. Coconut sticky rice. 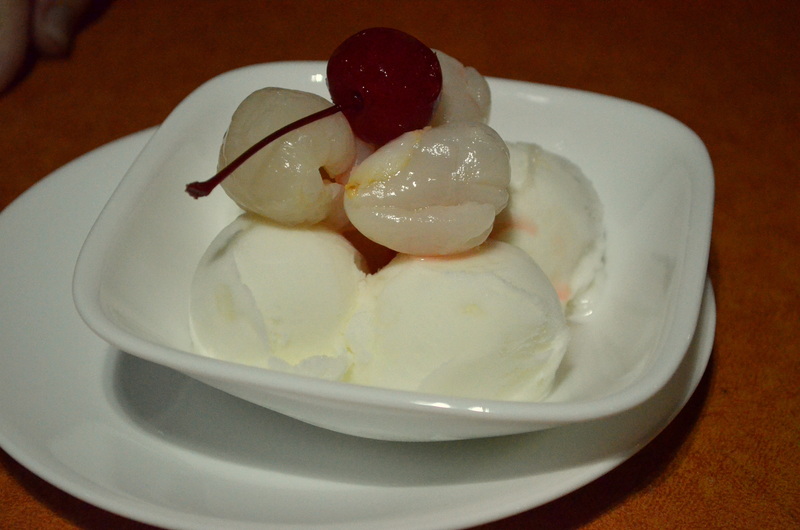 Lychee ice cream. This was a very nice surprise of a dessert, a tart, saccharine end to a meal, that soothes any aggressively spicy meal that might have come before it. For some reason, I’m a sucker for maraschino cherries. 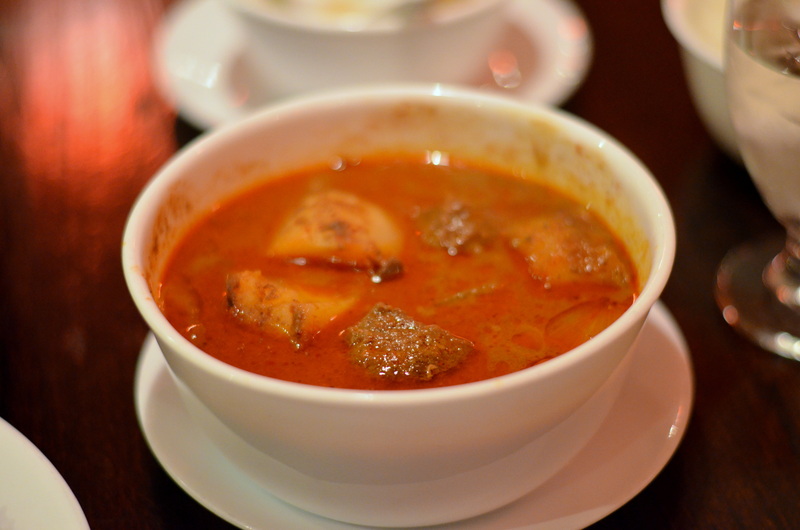 Overall, a very reliable place, with a consistent repertoire of Thai dishes (the menu’s pretty extensive, with enough mix-and-match sauce combinations and curries that you’ll have plenty of things to try for at least a good handful of trips).